Hyperkinetic and relentlessly inventive, Hard-Boiled Wonderland and the End of the World is Haruki Murakami’s deep dive into the very nature of consciousness. 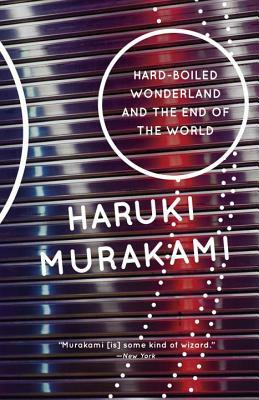 Across two parallel narratives, Murakami draws readers into a mind-bending universe in which Lauren Bacall, Bob Dylan, a split-brained data processor, a deranged scientist, his shockingly undemure granddaughter, and various thugs, librarians, and subterranean monsters collide to dazzling effect. What emerges is a novel that is at once hilariously funny and a deeply serious meditation on the nature and uses of the mind. Haruki Murakami is a best-selling Japanese writer. His works of fiction and non-fiction have garnered critical acclaim and numerous awards, including the Franz Kafka Prize, the Frank O'Connor International Short Story Award and the Jerusalem Prize, among others. Murakami's fiction is humorous and surreal, focusing on themes of alienation and loneliness. He is considered an important figure in postmodern literature. The Guardian praised Murakami as "among the world's greatest living novelists" for his works and achievements. Murakami is the author of 1Q84, The Wind-Up Bird Chronicles, Men Without Women and many more.